Find below important information regarding your upcoming Chennai Trail Marathon 2017. BIB distribution is on Saturday Sep 9th 9am-5pm at Kasturba Nagar Residents Association Community Hall, 3rd Cross Street, Kasturibai Nagar, Adyar Chennai. You can collect your BIB and (optional) t-shirt (size cannot be changed). Any race related queries can be clarified at our info desk. 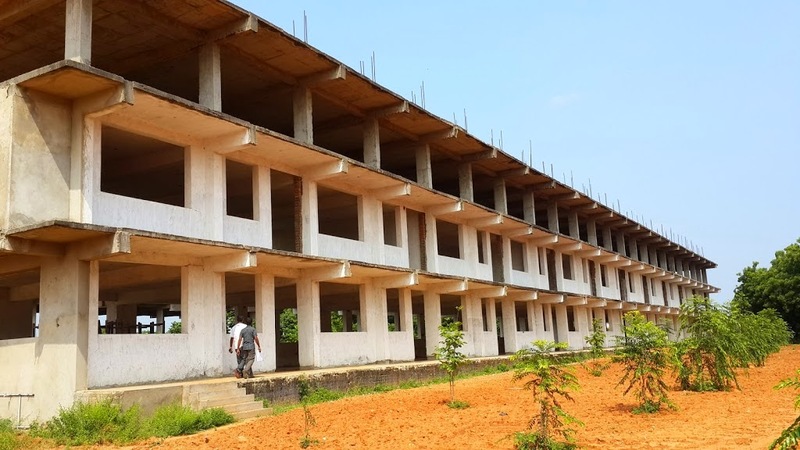 This email contains useful information on how to reach the running venue GOJAN College, facilities, overnight stay, reporting timings and event flow. Please read through it carefully. There is a large covered open space where runners can stay free overnight on Saturday (no separate registration required). Some 200+ runners and volunteers stayed at the campus in previous years. Those opting to stay overnight please bring along a sleeping mat, blanket and torch. Toilets are available at various locations around the campus. 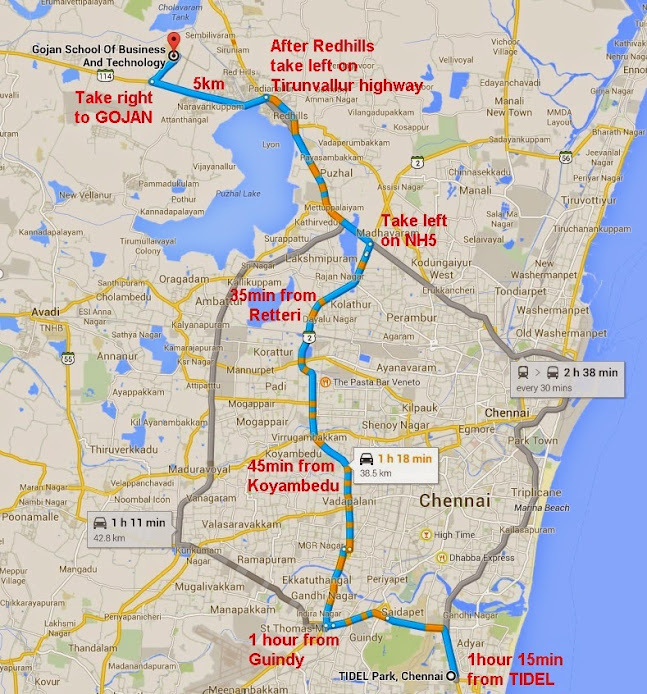 Outstation runners looking for a hotel to stay can consider the following suggestions, which are about 17 kms (45 mins drive) from the venue. Every runner gets one free post-run meal on Sunday, either breakfast (21.1 km), lunch (42.2 km & 50 km). Runners can show their BIBs to collect their breakfast/Lunch. Additional food coupons (Rs.100/-) for non-runners/visitors can be ordered in the below link. We have also arranged for dinner on Saturday for runners and their supporters/visitors who would be arriving at Gojan campus to stay overnight. Dinner coupon (Rs. 100/-) can be ordered the same link. Dinner will be served 6-8pm. Ordered food coupons can be paid and collected at the BIB distribution venue. Upon arrival enter the campus through the main gate entrance. Park your vehicles at the designated parking areas for bikes and cars – do not part your vehicles blocking the way or path. For any queries please report to our Info Desk. There is a luggage desk for those who wish to check in their baggage, but we suggest you to minimize your luggage for check in and keep most of your luggage, (particularly valuables) inside your locked vehicles. Organizers will not be responsible for loss or theft of valuables. Toilets are available at several locations around the campus – please help us keep the toilets clean and neat for others to use them. Refreshments/First Aid is available at the starting point. Our Volunteers would be available at the campus to help you out with any queries. Important – Runners (all categories) finishing beyond above cut-off timings will NOT receive medal and finisher e-certificate. The CTM2017 Running Route is a 21K loop around the Cholavaram Lake and includes a wide variety of terrain, resulting in a more enjoyable running experience for the runners. HM (21K) runners will complete a single loop, FM (42K) /Ultra (50K) runners will run the loop twice and Ultra runners will add another 4K linear stretch (U-turn) on top of the dam. The running routewill be marked with white paint along the trail. Mile markers and direction markers will be placed along the route. Aid/refreshment stations are deployed at approx. every 2.5K and you will be crossing 10 aid stations along the entire loop. Start and finish are at the GOJAN college campus grounds. 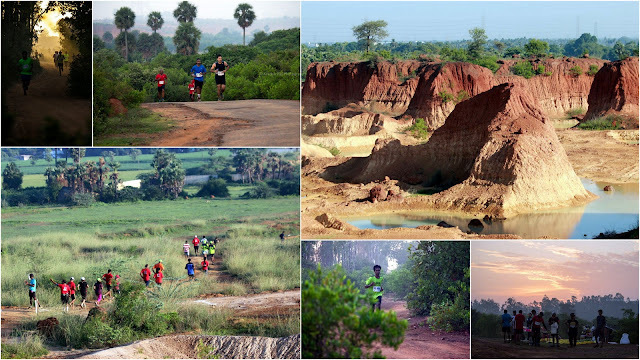 The 21K running route is a multi-terrain marvel – the runner will pass across dams, through cashew farms, inside canyons, through paddy-fields, small villages, sand trails through dry river beds and across vast grass lands. The trail is a mix of hard dirt track, red soil with small gravel, sand trails, a bit of tar road and grass land. It is slightly uneven in some places and there is a small elevation drop/gain in several sections. Running on an uneven trail requires more presence of mind from the runner (especially FM/Ultra runners in the dark) to stay balanced. Do not venture off the trail into any surrounding water bodies or greenery. Barefoot running is not recommended as there is a 2K stretch with hard gravel near the canyons. Runners are advised not to throw any cups, wrappers (chocolate/gels), other waste either on the trail or inside water bodies. Use the waste bins kept near the refreshment points. Cholavaram tank is one of the well maintained tank and major supplier of drinking water to the people of Chennai city. Therefore, requesting the co-operation from the runners to maintain the cleanliness of the tank and the trail. If you require any other refreshments while running then please arrange the same yourself. CTM 2017 is a timed event, therefore every runner is requested to ensure that their timing chips are properly attached to the BIB. Ensure that they run through the timing reader antenna kept at the starting point of the run and also ensure that they run through the timing reader antenna during the completion. Attach your BIB to your running t-shirt, ensure that the Timing chip is properly attached to the BIB.